A further look at some of the latest releases at Auckland Libraries 'Sir George Grey Collection'. 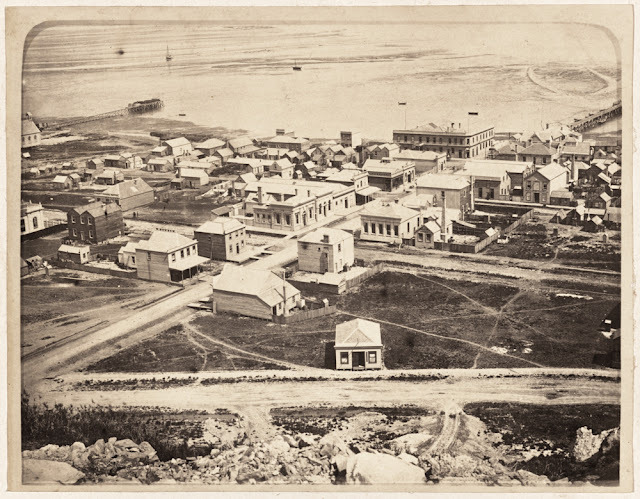 The photograph taken c1870. While the views may have been seen before, the quality of the photographs make them worthy of another look. The road directly in the foreground is Pollen Street, while the one running lower left to the sea is Albert Street. The street runs right to the first major wharf, usually known as Curtis' Wharf. 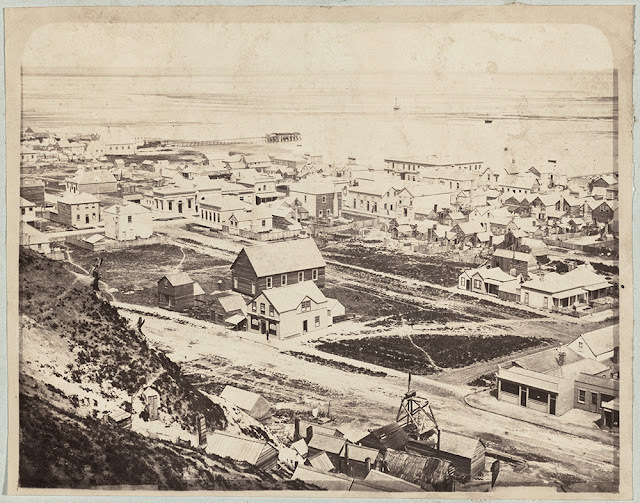 Top right you have the enormous Pacific Hotel, and on the north side of Albert Street the Wharf Hotel - later known as Park, then lastly traded as the Lady Bowen Hotel. Top left is a glimpse at the Wesleyan Church at the end of Cochrane Street and then the Holdship Timber Wharf. 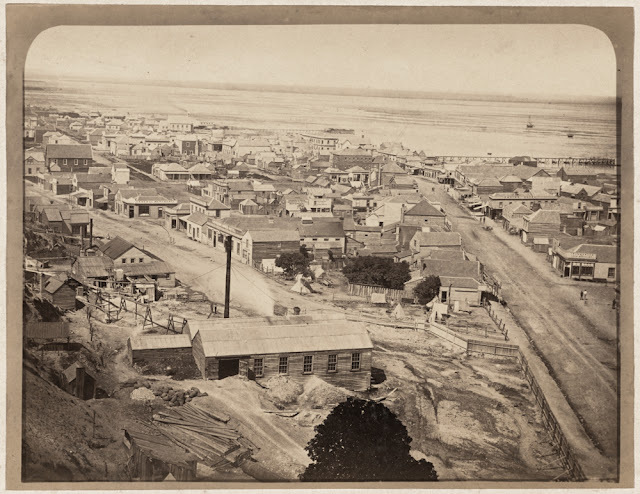 Just a glimpse at the busy business district that surrounded Albert and Brown Streets. The view below looks south, from further along Pollen Street. Spot the Pacific Hotel to get your bearings and identify the intersection of Brown and Albert Streets. The lower right corner is the intersection of Pollen and Williamson Street. The roads are so clearly marked, nothing more than dirt, packed hard until the next rain storm which turned them promptly to mudpools. Look now to the photograph below and, use the landmarks above to understand the location. See the two houses with the verandahs (above centre right and find them in the photograph below. They are centre left). The road on the right leads from Golden Crown Street, up to Owen Street and then to Brown Street in the distance. The town of Graham's Town aka Grahamstown is the bustling metropolis of the goldfields. What an amazing goldfield town, that in 1873 would become part of the Borough of Thames.